GROUND ZERO PLUS 1231 DAY--New York, NY, Tuesday, January 25, 2005--Terrorism often takes a nap--or so we think. The absence of violence and death in our particular neighborhoods lulls many of us into somnolent states of Complacency. We become intoxicated with the idea that just because the blood and guts of our neighbors aren't running in the gutters that we might have a respite from the fangs of the Beast of Terror. Others might think that Iraq is the bone we are throwing Terrorists, and that all the deaths thousands of miles away is a means to consume the attention of the Terrorists so they don't bother us. Then we watch the HBO movie, Dirty War. We sober up quickly. That soft, cuddly cradle of Complacency instantly turns into a bed of sharp nails, tipped with anthrax, and we see our children and grandchildren spread eagled upon the deathbed while we stand helpless as they scream for us. 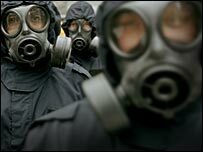 Dirty War is a BBC production of what happens when Terrorists plant "dirty bombs" in London and successfully blow up one of two. A radioactive cloud suffocates the heart of the city, rendering it unlivable for years as the radioactivity slowly dissipates. 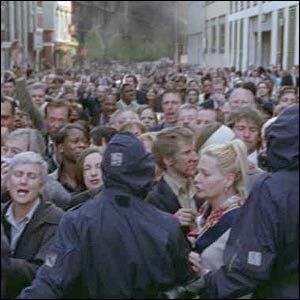 Hundreds of thousands of people are herded into the "containment area" after suffering exposure and finally burst through police lines instead of waiting for nearly a day to go through inadequate decontamination tents where their bodies are washed and their clothes and any artifacts such as jewelry or watches are trashed in the "hot bin," with all the other radioactive material. 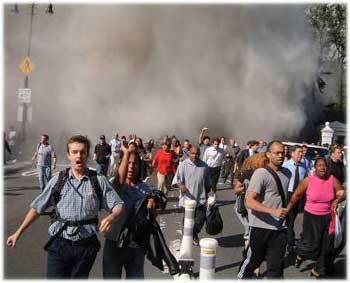 I survived Ground Zero on September 11, 2001. It was mayhem. People stampeded when the buildings collapsed, trampling others, eyes glazed, hypnotically infused with "save myself" and losing what we might consider the "consideration of civilization" where we are more concerned with our fellows than ourselves. In a disaster, it is predominately "every man and woman for himself or herself." In the BBC film there was the one shining sinew of strong moral character pulsing in the midst of an otherwise horrific display of human nature--that was the four firemen who stayed in the center of Ground Zero with fire hoses shooting them at towering skyscrapers. It was an absolutely incredulous scene since it resembled four men trying to urinate on an exploding volcano as though they might possibly be able to stop the molten magma from burning through to the center of the earth, however, the pointed ideal that at least some humans care about others humans more than themselves, was made. I shuddered after watching the show. It made me realize how Complacent we are in America regarding preparing for a Terrorist biochemical or dirty bomb attack. It made me also realize how important it is for Americans to take on the responsibility of being their own heads of Homeland Security and not waiting for the government to issue statements about what the "gov" is doing to protect them. If there ever was an example of the emaciation of government to help out the general population it was Dirty War, for there was absolutely nothing the government could do in the end. People sought to save themselves and paid no heed to any authority. In Israel, a key target for countless years, Terrorism is taken to heart by each citizen. In each home is a "safe room," stocked and ready to provide the most possible protection for family members in the case of biological assault. Usually, the worst place to be in such a situation is outside unless you have such a "safe room," stocked with supplies and anti-biochemical tools to give family members a "fighting chance" to survive. The absence of such a room leaves any citizenry vulnerable, for in the face of an insidious attack by some airborne biological or radioactive element, panic ensues. When people have no plan and are not prepared, and worse, expect others to protect them, and then find that there is no plan by others to aid them, the worst happens. 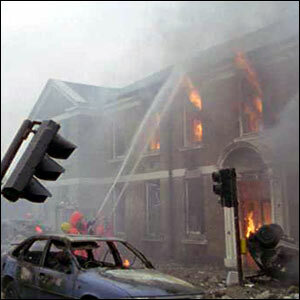 Dirty War was all about the worst happening by a major city ill prepared for such an attack. It all could have been resolved, or at least mitigated, if the government were to issue to all the citizens the importance of building a "safe room" in their home or apartment. That room would be where all family members went to await further news. It would be protected as best as possible from the Terror elements. A Parent of Vigilance needs a plan and a place for his or her family. In Dirty War, we saw only adults in panic. There were a few pregnant women, but no children. That wasn't accurate. In any disaster there will a preponderance of children. Our first goal should not be to worry about ourselves but our children. That's why we need our Vigilance Kids Safe Rooms. If for no other reason, we need to be stimulated to protect them as best we can. If you aren't sure how it all works and why, then watch the HBO movie Dirty War. 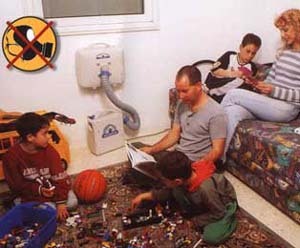 Study how the Israelis are fighting Terrorism family by family and not expecting the government solely to do it for them. Perhaps then you'll become a Parent of Vigilance to avoid the dangers of a Dirty War. Go To Yesterday's Story: The Eternal Value Of "Spies Of Vigilance..."